This place is a bit of a drive from where I live but is totally worth it! This was my third visit here, but first at lunch time and love it more and more everytime. 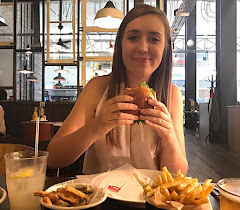 When you eat here in the bar area , you can not book and it is all first come first serve. It is quite big though but still has that cosy feel somehow with a lovely wood burning fire at the back. The staff were all very friendly and helpful and even helped Ashlea as to which real ale he should have. These change regularly and are usually local ones too! I thought it was clever that they put a sample in a little jar in front of the tap to show you the colouring. We sat outside in the garden as it was a lovely day and couldn't let it go to waste. There are plenty of tables outside along and they are directly in the sun which was great, with some patio heaters for when it gets a bit chilly. 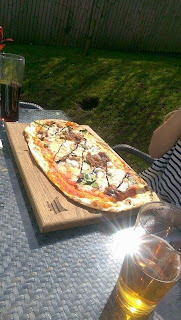 There's a choice of two menu's, the main A La Carte (which includes lighter options such as sandwiches) or the wood fire pizza menu. I chose to have one of the freshly made pizzas called 'The Athens' - Goats cheese, home made tomato sauce, mozzarella, caramelised red onions, spinach and a balsamic glaze. It was delicious, probably the best pizza I have ever had, plus its massive and comes beautifully served on a Bulls Head wooden board. I had no problem finishing this myself!! 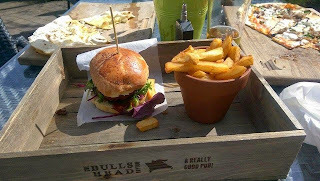 Ashlea is big on his burgers, so chose 'The Bulls Head BBQ Burger' which again comes very nicely presented in a wooden box. One of these bad boys consists of two 4oz burgers, bacon, BBQ sauce, Applewood smoked cheddar and comes with a side of what they call 'Real Chips' which are amazing and come in terracotta plant pot! How cute! I thought about having a dessert, so chose to have a lemon sorbet. When I have visited before at night, you are given some of this lemon sorbet in between your starter and main to cleanse you pallet and it is refreshingly tasty. I ordered a scoop of this just for that little bit of sweetness but nothing too filling, afterall I had just eaten all of that pizza! 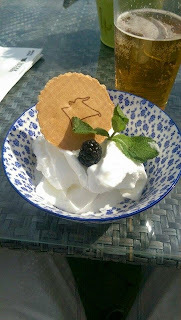 This was perfect for the summery day that we had sat outside. Bliss. The sorbet came garnished with a Bulls Head wafer too which was great, those little things! I would definitely recommend this place to anybody! I hope to go back soon and can not wait. It's a great place to get away to if you're looking for somewhere different and is worth the drive, there's no doubt about it. If you're coming at night, I would recommend booking - the garden room especially as it's the best place to dine in out of the 3 rooms. Trust me.